To view the Meconium Testing Panels and Collection Instructions, click here. To help you have the best possible solutions that science can offer, we are consistently evaluating our processes to keep them ahead of the curve. As science progresses, so do our capabilities. Because of such progress, we have some important updates to the meconium collection process. Effective July 18, 2016, USDTL will be implementing a new way of reporting quantitative results. In order to satisfy accreditation requirement, the concentrations of drugs exceeding the Upper Limit of Quantification (ULOQ) for any given drug will be reported as > ULOQ (greater than ULOQ). The ULOQ will be provided. is directly related to the amount of specimen needed to screen and confirm for the panels we offer. The initial screening uses a portion of the original specimen and the confirmation testing uses another portion of the original specimen. To forensically confirm positives, means running a new test, with a new portion of the original specimen, using a different analytical technique. It is our first priority to deliver testing results that provide the most valuable information possible for your substance abuse testing needs. To better accomplish this duty to our clients, we are updating our policy concerning specimens that do not have sufficient volume for both preliminary testing and confirmation. Effective April 1, 2015, confirmatory tests that cannot be completed due to insufficient specimen volume will be canceled on an individual drug class and/or analyte basis. We will report confirmation results for each test for which there is sufficient volume of specimen available, giving you access to more information. *Click the green and white plus sign beside each question to view the answer. Can Meconium Testing for FAEE be run in conjunction with testing for panels for illegal drugs? Yes, Meconium Testing 5-, 7-, 9- and 12-drug panels can all be bundled with Meconium Testing for FAEE. Can you test for alcohol exposure in meconium? Yes, alcohol exposure can be tested individually or by adding the Meconium FAEE add-on to any of the Meconium Testing drug panels. The FAEE add-on screens for Fatty Acid Ethyl Ester, a direct ethanol biomarker, including exposure to ethanol (drinking alcohol). To report out a positive FAEE result, the laboratory must verify that the specimen was collected less than 18 hrs from the time of birth. If the final time of collection is greater than 18 hours from the time of birth, the specimen will be rejected for FAEE testing, and the following comment will be added to the specimen report: "Not suitable for FAEE testing due to delayed specimen collection." Do doctors know about Meconium Testing for FAEE? 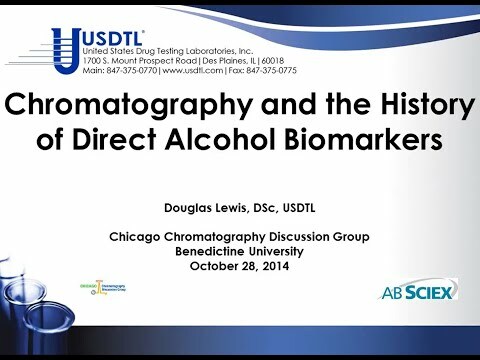 Does USDTL have a means of informing doctors of this new test? Yes and No. Many physicians know about the test from scientific publications and literature from USDTL. There are, however, many physicians that are not yet knowledgeable about the test and have never ordered it. If your local physicians do not have the necessary information to order the test, call Client Services at 1-800-235-2367 and the scientific information will be supplied. Have meconium results been used in court cases? Yes. Meconium results, when determined using two separate, validated laboratory procedures based on different scientific principles, are forensically defensible. Our laboratory procedures have been scrutinized by laboratory inspectors, and our test results have been upheld in court. How are meconium results reported to the hospital? Generally, results are reported to a secure fax at the hospital facility. This number is confirmed as secure when your account is initiated. As encryption programs improve, developments in e-mail and web-based internet reporting are being developed. Under no circumstances are results ever given via telephone, since the laboratory has no definite indication of the identity of the caller. How can DHS Methamphetamine specialists use information about Meconium Testing for FAEE to improve our protection of children? Results from Meconium Testing for FAEE give DHS personnel direct information about newborns who have been exposed to high levels of Ethyl Alcohol. Approximately 3 percent of all newborns have been exposed to high levels of alcohol and these newborns’ meconium specimens have FAEE levels greater than 10,000 ng/gram. This “red flag” level represents only one quarter of the total number of alcohol exposed newborns. Three quarters of alcohol exposed newborns were exposed to small or moderate amounts of alcohol and represent lower risks of manifesting signs and symptoms of Fetal Alcohol Spectrum Disorder. The newborns with FAEE levels greater than 10,000 are at higher risk for Fetal Alcohol Spectrum Disorder, as well as a higher probability of living in a chaotic environment where abuse or neglect is more likely. How does NIDA and the court system view the validity of Meconium Testing for FAEE? NIDA (The National Institute on Drug Abuse) actually is NOT the institute that funded the original research for FAEE in meconium. It was the National Institute for Alcohol Abuse and Alcoholism (NIAAA) that provided USDTL with the grant funds to develop Meconium Testing for FAEE. This test has become the de facto standard for laboratory diagnosis of fetal alcohol exposure and is in routine use all over the United States and Canada. Courts have held that Meconium Testing for FAEE meets both the Fry and Daubert standards, and the results are admissible in adversarial proceedings. How many days until I receive results? Screen negative results will be transmitted to your secure fax on the same day on which the laboratory receives the sample. Screen positive results will be confirmed using a separate technique and reported 2-3 business days after specimen receipt. How much meconium is needed for the test? A minimum of 2 grams of meconium (a teaspoon) is normally required, although some tests, such as "confirmatory tests only" can be performed with less. However, for best results, we recommend collection of the entire passage of meconium until the milk stool appears. Mother tested negative for chemicals on a saliva test, 8 days later, her baby was born and its meconium drug screen showed the presence of methamphetamine and amphetamine. What does this mean? This is an excellent example of the difference in the time window between meconium and saliva. Saliva will reflect use for up to 48 hours after use of methamphetamine. Meconium reflects weeks of past exposure history. In this case the maternal use did not fall into the time window available from a saliva sample but the meconium specimen did provide a broad enough window to identify the newborn as methamphetamine-exposed. The take home message is that meconium reflects weeks to months of exposure history whereas urine and saliva provide hours to days of history. Please describe the new meconium test for alcohol. Meconium Testing for FAEE is a test of the non-oxidative metabolites of ethanol called Fatty Acid Ethyl Esters. These metabolites are the chemical combination for endogenous fatty acids present in the blood of a fetus and Ethyl Alcohol. These new compounds, which only form when the fetus is exposed to Ethyl Alcohol, are deposited into the fetus’s meconium and can then be detected and quantified from the newborn’s meconium after delivery. The amount of the Fatty Acid Ethyl Esters found in the meconium is representative of the amount of Ethyl Alcohol the fetus was exposed to during the last half of the pregnancy. 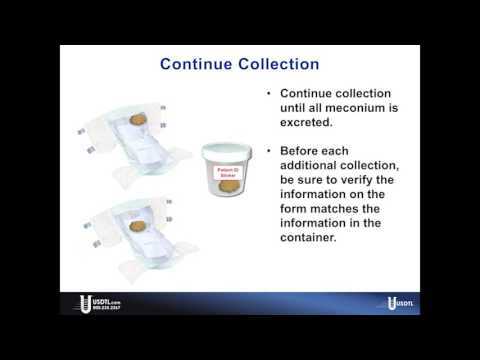 What are the meconium sample storage requirements? Drugs and metabolites are stable in meconium for up to 2 weeks at room temperature. However, refrigerated or freezer storage is preferred. Alcohol metabolites, specifically FAEE, are sensitive to heat and light and therefore the PREFERRED shipping method is frozen on dry ice. Since this method is both difficult and expensive, most institutions send at room temperature and realize that the FAEE concentrations may be reduced. USDTL accepts specimens that are shipped at room temperature. What information can you give on testing of meconium and why some experts state that it depends what part of the meconium is sent into labs as to what will test positive? The single most important element of collecting meconium for drug and alcohol testing is obtaining the entire quantity of meconium that the newborn passes, being careful that it is not to mix in the milk stool. This is extremely important in order to obtain the maximum time window of exposure for the infant. Meconium is a HETEROGENOUS material and each portion passed reflects a different time of gestation. This is due to the extreme viscosity of the meconium mass and the lack of significant mixing in the fetal intestine. If only a portion of the total meconium is collected and sent for analysis, it may reflect a period of abstinence, and an exposed newborn may go undetected. Meta-hydroxybenzoylecgonine (m-OH-BZE) is a metabolite of cocaine which is often present in the meconium of neonates born to cocaine-using mothers. It is a minor metabolite in adults, but it has been identified as the only cocaine metabolite present in 23 percent of meconium samples screening positively for cocaine. If a laboratory does not include m-OH-BZE in its confirmation profile, there is a risk of not identifying up to 23 percent of cocaine exposed newborns. What is the relationship between alcohol consumed and FAEE levels? 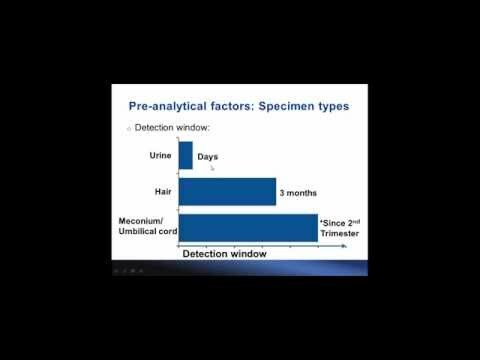 What is the window of detection for meconium? Meconium begins to form in weeks 16 through 20 of gestation. 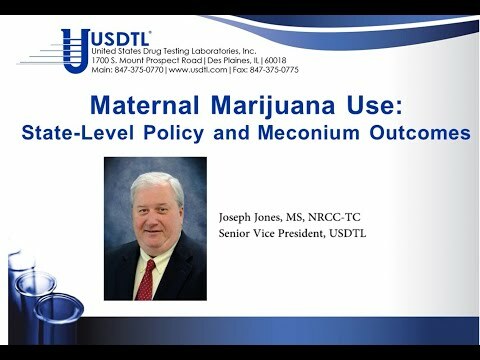 Therefore, depending on the gestational age of the newborn, a complete collection of meconium will represent approximately 20 weeks of maternal drug use history. Why test for fetal alcohol exposure when there is no treatment available? There are several reasons why diagnosis of alcohol exposure is important. As with any disease, early diagnosis provides for many more options and treatments than detection at an advanced stage. Early diagnosis of fetal alcohol syndrome (FAS) and fetal alcohol effect (FAE) allow newborns to be identified and enrolled into early intervention and treatment programs. New programs are showing dramatic improvements in children identified earlier in life. Detection of an alcohol affected child can allow help, intervention and treatment to be offered to the mother, so that future FAS and FAE children may be prevented. When cocaine- and opiate-exposed newborns were first detected, there was no treatment. As programs, understanding and treatments improve, diagnosis at a very early stage can only help the outcome of the child, mother and family.